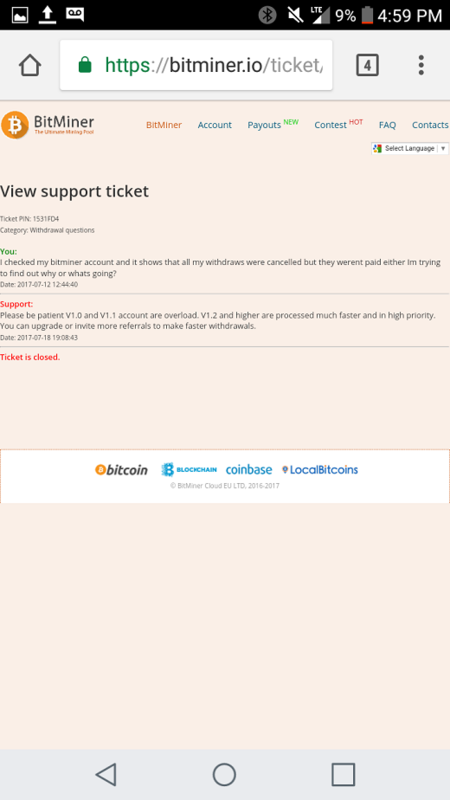 Steemians do any of you use the bitcoin website Bitminer.io ? If you look at the bottom right hand corner of the screen shot you'll notice some say cancelled ( Which I'm not even sure why) and then some say pending, the cancelled ones said pending before they moved in to the cancelled state. 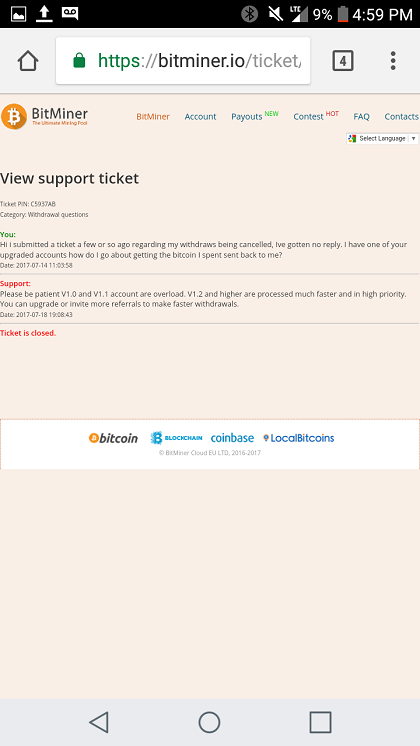 with this said I felt the need to begin emailing support and below you will see what I got from their support. This is a screenshot of one of the first email complaints. after the second reply I did e-mail once more before realizing the same thing was being sent as a reply to me each time, in which case I figured out it was a bot. Fellow Steemians the pictures and data above that I've shown you is my end result with bitminer.io, if any of you have had success with this website please comment and let me know. Thanks for reading my post. I agree with that, whats messed up about it is, a lot of newbie people will try to get in to the cryptocurrency game and they end up going to places like that bit miner and start miner website and once they've gotten scammed its over with they give up on cryptocurrency in general. This post has been ranked within the top 10 most undervalued posts in the first half of Aug 12. We estimate that this post is undervalued by $36.58 as compared to a scenario in which every voter had an equal say. This post received a 2.9% upvote from @randowhale thanks to @currencycrypto! For more information, click here!